Caramigo is present this year one more time as usual in The Stuttgart Cup, this season participating our cars in the Mission Foods GT3 Cup Championship and our drivers. 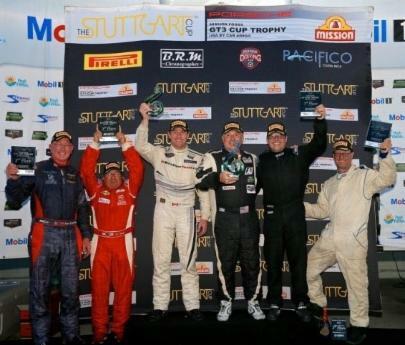 SEBRING, Florida (December 7, 2014) – The Stuttgart Cup™ and Mission Foods GT3 Cup Trophy USA by Car Amigo crowned 2014 Champions Sunday after victories in the season-ending Four Hours of Sebring by Bill Riddell and Steve White. The Mission Foods GT3 Cup Trophy USA By Car Amigo announced today that it will return for a third exciting year of Porsche GT3 Cup racing and will have its largest schedule to date by running exclusively with Historic Sportscar Racing (HSR) during the 2013 season. The Mission Foods series will run the full HSR schedule as the two groups join forces and share operational support with one simple goal, to give Porsche GT3 Cup owners a safe and exciting venue where they can race among each other in an exclusive and competitive way at some of the top racetracks in the United States. The 2013 season begins at the Palm Beach Grand Prix on February 14 – 17, at Palm Beach International Raceway. The newly renovated 2.034-mile, 11 turn circuit is quickly becoming a favorite among racers and the South Florida weather should offer a great opportunity for Mission Foods and Car Amigo to host their season opener. The season continues on to the Mitty at the picturesque Road Atlanta on April 25-28. This major event is a favorite for vintage racers across the country and served as the season opener in 2011 for the Mission Foods GT3 Cup Trophy. After a summer break the series returns to Road Atlanta on September 19-22 for the Atlanta Historic Races. The fourth event of the year will take place at the Savannah Speed Classic as part of the Hilton Head Island Motoring Festival & Concourse D’Elegance on October 24-27. The Mission Foods series heads back to Florida for its last events of the year at two of the most famous and admired racetracks in North America, Daytona International Speedway on November 14-17 and Sebring International Raceway on December 5-8. The Mission Foods GT3 Cup Trophy USA by Car Amigo is preparing for another successful season featuring new venues, an expanded field, and another year of exciting side by side exclusive Porsche GT3 Cup races. Braselton, GA – April 30th, 2011 – Michael Mills took the overall and Group 1 victory from pole position at the exciting debut race for the Mission Foods GT3 Cup Trophy USA by Car Amigo which took place at Road Atlanta during the Mitty, one of the premier vintage racing events in the country. 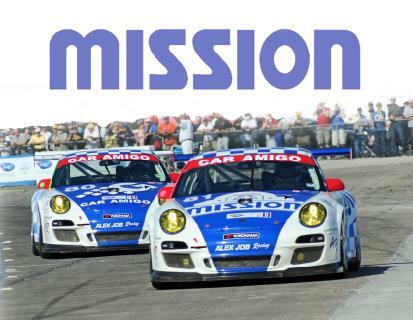 The Mission Foods GT3 Cup Trophy USA by Car Amigo is a Championship for 911 996/997 GT3 Cup cars which is run as a class or a stand-alone race. The series is part of the Porsche one make network and is positioned below the GT3 Cup Challenges to give owners of elder GT3 Cup cars the possibility to compete with their cars. It will be open to Porsche Cup GT3 RS/RSR cars from 2000 to 2012. The series is divided into three groups that will compete for their own championship points and prizes. Group 1 will be for all 997 GT3 Cup cars, Group 2 will be for the older 996 GT3 Cup cars, and Group 3 will be an open category for any other GT3 Cup car that does not apply to the first two groups including RSRs, GT3Rs and Rolex cars. From amateur drivers to professional racing teams, the series will be able to accommodate all GT3 Cup owners by offering a wide array of customizable services including car preparation, driver coaching, data acquisition services, catering and hospitality, among others. The newly formed Championship will join a variety of sanctioning bodies as it forms a unique and exciting exclusive Championship throughout the United States. Car Amigo is a motorsport restoration and preparation business specializing in restoring racing, muscle and historic cars. This Dallas, Texas based company offers complete rebuilds and custom fabrication as well as consignment and sales of history’s finest automobiles, www.caramigo.com. Tooele, UT, (July 11, 2010), Alex Job Racing's (AJR) Juan Gonzalez and Butch Leitzinger finished second in GTC in today's running of the American Le Mans Series (ALMS) presented by Tequila Patron Larry H. Miller Dealerships Utah Grand Prix. The duo has a four race podium streak going so far this season. Starting from the ninth position on the GTC grid, Juan Gonzalez drove a solid first stint handing the No. 81 Mission Foods/Alex Job Racing/Porsche 911 GT3 Cup car over to Butch Leitzinger in fifth place. Leitzinger proceeded to lock horns with the No. 63 car, challenging for second, for his entire stint until lap 76 when both cars pitted together. The AJR crew got Leitzinger out first, overtaking the 63 in the pits and he proceeded to bring the car home in second. "It was unbelievable," Juan Gonzalez said. "We qualified in the ninth position because of a shock problem. I wanted to make sure to do a safe stint and stay out of trouble. The guys fixed the car from qualifying and it was perfect. I did good lap times and wanted to give the car to Butch with everything left. Another great day,"
"It was a very good run today," Leitzinger said. "The team did a great job with strategy, pit stops and the car. We were able to overcome the problems that we had in qualifying yesterday. It is one step from perfect, but very good. We are very happy with it way it turned out. Once again Juan was very solid at the start and the race came to us and we took full advantage." Bill Sweedler started the No. 23 Battery Tender/Tequila Patron/Alex Job Racing/Porsche 911 GT3 Cup entry from his eighth place starting position and began picking off the competition from the drop of the green flag. On lap six, running second, Sweedler was heading into Turn Six and came upon a slow moving GT car and was struck from behind by the AJR 80 car. The damage caused a flat tire forcing him to limp around for repairs going down two laps. Kapudija took over and just logged as many laps as possible trying to salvage as many points as possible. "We had a really good car," Sweedler said. "At the start I was able to make up several positions at the start. I was in second position in class. I then got caught up behind a slower GT car that checked up in turn six and we got bunched up behind and I got hit from behind by my teammate Ricardo. He had nowhere to go and I think he was hit as well. We had to pit and change the tire and we went back out two laps down." "It was a tough day for the 23 guys," Kapudija said. "Unfortunately we have had two tough races now that are really thrown away from being hit from behind. We need some luck. The guys put together a great car and Bill was doing an excellent job to move through the field. When I got in the car the steering had six-inches of play, it was tough to drive. I kept going to try and salvage as many points as possible." Ricardo Gonzalez started the No. 80 Car Amigo/Alex Job Racing/Porsche 911 GT3 Cup car and was running strong in third place. Like the 23, the 80 car was involved in the Turn Six incident which caused substantial damage to the Porsche resulting in the car being retired on lap six. "It's very disappointing," Ricardo Gonzalez said. "We were very optimistic for this race, we had a very productive week of testing and then Luis did a great job qualifying our No. 80 Porsche in the third position. At the start of the race we were running third and just taking it easy. Everybody got kind of bottled up coming into Turn Six and I saw a gap and went for it. The No. 23 car came down on me, hit me and broke my front suspension. It was a very aggressive move and I want to think that he just didn't see me because there was no reason to do that so early in the race. It´s a shame, but all we can do now is move on to the next one, we´ve already proven we have the speed now we just need to get the results." "It´s very frustrating when you have such high hopes for a race and you don't even get to drive," Diaz said. "We knew we had a great shot here because we were fast and Ricardo and me together are definitely one of the strongest driver combinations out there. But we didn´t even get to show it today. This is going to hurt us in the points but all we can do now is look forward and try to win some races to get back in the hunt." Alex Job, team owner, comes away from the weekend with mixed emotions. "Juan and Butch had another very solid run. Juan did a great job at the start and Butch was able to continue to move the car to the front and finish in second. As a car owner the worst thing that can happen is to have two of your cars come together in the race. We had that today with the 23 and the 80 and that cost both cars a lot of points. Bill had a very solid start and Ricardo was running in third, so our day looked very positive on lap five, only to go south on lap six." Round five of the American Le Mans Series presented by Tequila Patron will be run at Lime Rock Park on July 24. Tavares, Florida, (July 6, 2010), Alex Job Racing (AJR) is heading to round four of the American Le Mans Series (ALMS) presented by Tequila Patron race to be run at Miller Motorsports Park on July 11. Job has his three cars in the top three positions in the GTC points standings. The series is coming off of their yearly month-and-a-half Le Mans break. Juan Gonzalez and Butch Leitzinger lead the GTC points with 68, teammates Romeo Kapudija and Bill Sweedler are second with 48, Luis Diaz and Ricardo Gonzalez are third with 42. The team is ready for second half of the season. Miller Motorsports Park, located outside of Salt Lake City, is one of the longest courses on the schedule, utilizing the 3.05-mile, 14-turn layout. With temperatures predicted to be in the 90's, concentration around this long layout will be a key element to team success. Juan Gonzalez and Butch Leitzinger, in their No. 81 Mission Foods/Alex Job Racing/Porsche GT3 911 Cup head to Miller with the overall GTC points lead. The duo got there by winning the season-opening Sebring 12-hour race, followed by a sprint win at Long Beach and a third place at Mazda Raceway Laguna Seca. The pair will be looking to keep the consistent running going this weekend. "This will be my first visit to Miller," Juan Gonzalez said. "Butch and the team have raced there many times, so I will study the data and get a lot of coaching from Butch and Luis to help me get to know the circuit. We are leading the points and have gotten there by employing good strategy and making no mistakes on the track. We will take that same approach this weekend." "Miller is one of my favorites," Leitzinger said. "Although it seems flat, just about every corner has some elevation change to it. There are several challenging, high speed corners. The layout affords many opportunities to set up a pass. It is a very well laid out circuit." Bill Sweedler and Romeo Kapudija are still looking for their first win in the No. 23 Battery Tender/Tequila Patron/Alex Job Racing/Porsche 911 GT3 Cup entry. The duo will be looking to put their speed together with good strategy and stand on top of the podium with the 23 team. "I only raced at Miller once and it was not a very good race," Kapudija said. "My favorite part of the track is Turn One because it's a fast corner in which you carry all that speed through Turns Two and Three. Therefore, you have to be quick through One in order to carry the speed through the next couple of turns. A good handling car is always a must, but straight line speed will be very important since the track has long straights and sweeping corners. There are very few reference points at Miller Motor Sports Park and precision driving will be crucial. Heat will also play a major factor and I am hopeful my sauna workout regiments will be helpful." "Miller is like racing on the moon," Sweedler said. "You are surrounded by the Rocky Mountains and vast amounts of grey gravel and dust. The track is super fast, smooth, and flowing, with no real reference points to focus on. The fans have always been big supporters of our series. It is one of my favorite tracks to race on. My favorite turn at Miller has to be the last turn coming on to the main straight. Seriously, Miller has many awesome parts of the track, but the last turn, which appears very simple, is a lot faster than it looks due to the banking. Carry too much speed and you run out of track, consequently lifting the throttle, which in turn ruins what could have been an amazing lap. Therefore, this turn gets my vote and most important. It can mean as much as a second hitting it perfectly in the GTC cars. The AJR team has done a superb job getting the car set-up at every race. Between Alex, Greg (Fordahl) and the rest of our crew they get it right every time. I'm sure that Romeo and I will have a contender with the Battery Tender/Patron Tequila car. I look forward to getting back to racing after the Le Mans break." Luis Diaz and Ricardo Gonzalez are ready for the second half of the season in their No. 80 Car Amigo/Alex Job Racing/Porsche 911 GT3 Cup car. Diaz was a pole sitter and winner at Miller last year in the P2 class. He will be looking to impart that track wisdom to teammate Gonzalez as well as have a break through weekend. "It's great to be back at Miller Motorsports Park," Diaz said. "This is one of my favorite tracks. It is very fast and it has a very challenging layout. I have great memories from this track, last year we won here and we are very optimistic that this year we can score our first victory this weekend. This whole season we've had very limited track time, both Ricardo and I have had to adapt to the GTC cars always during the race weekends with no real testing time. Here we are going to get to test for a few days and finally get to work on the car and on our driving in a more relaxed environment. We've been very close to the front before, but with this additional track time we are going to become an important threat for victories." "I had never been to Miller Motorsports Park before," Ricardo Gonzalez said. "I did a lot of laps on the simulator and that definitely helped to learn the layout. This morning I went out for the first time and it felt great. We got up to speed right away and although we still have a lot of work to do we are already one of the top cars out there. I'm sure after this whole week of testing that by the time the race comes around we'll be able to fight, not only for pole position, but also for the win." Alex Job, team owner, took his team out early putting them through a rigorous test schedule which started today, Tuesday. "We wanted to come to Miller early so we get the guys a lot of laps around this tough track," Job said. "I also wanted to get them back into race mode after having almost 90-days off. We have all three cars at the top of the points page and we want to keep that momentum going. We are coming to a stretch of races at great tracks and we took the time off to go through the cars and make sure we were ready for the schedule to come." Round four of the American Le Mans Series presented by Tequila Patron will be run at Miller Motorsports Park on July 11. The race will be televised live on the SPEED Channel starting at 4:30 p.m. ET. The full race will be streamed live online at www.americanlemans.com in partnership with TodoCast.tv. Monterey, Calif., Alex Job Racing's (AJR) Butch Leitzinger will start from the front row in second position on the GTC grid for tomorrow's running of the American Le Mans Series (ALMS) Monterey presented by Tequila Patron to be run at Mazda Raceway Laguna Seca. AJR teammates Bill Sweedler and Ricardo Gonzalez qualified in the eighth and ninth positions respectively. 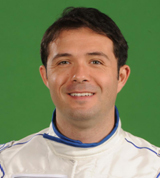 Leitzinger and co-driver Juan Gonzalez (GTC Series points leaders) were able to establish a good baseline set-up on their No. 81 Mission Foods/Alex Job Racing/Porsche GT3 911 Cup car in yesterday's practice session. The cool temperatures, in the lower 60s, and higher than normal winds made for changing track conditions around the 2.2-mile, 11-turn circuit known for its famous Corkscrew Turn. Leitzinger posted a last lap qualifying time of 1:27.603 that give him a clear view of the first turn from his front row starting position. The duo will be going for their third win in as many races. "I got a decent lap in the beginning," Leitzinger said. "The traffic started to get intermingled and I couldn't get a clean run at it again until the last lap, which put us into second. It took me that long to get a clear a lap. I thought I was positioned right and then someone would come out of the pits. We are still not on the ultimate pace. We need to find a little more speed. The team always do a great job of giving us a strong car off of the truck. We have made minor adjustments on the set-up, but we are pretty close. It is going well. It is usually a headache to setup a car here. The AJR guys have already had those headaches, so it makes our job easier. The race will be like Sebring. If we can stay out of trouble we should be on the podium. First and foremost we will need to stay out of other peoples accidents. We need to pay attention and keep our head on our shoulders." "So far this weekend has been a big adjustment for me," Juan Gonzalez said. "It has been 11-years since I have been here last. It is a new car for me here. The elevation and the corners, you forget how big they are at this track. With this light car and little tires you have to run the car a little different. You are not only battling the traffic, but also the sand that is brought on the track from the other cars and the wind. We will go into race mode now and concentrate on strategy for the six-hours tomorrow." Bill Sweedler will start the No. 23 Battery Tender/Tequila Patron/Alex Job Racing/Porsche 911 GT3 Cup entry from the fifth row on the strength of his 1:29.360 time. Sweedler shares the seat with Romeo Kapudija and Jan-Dirk Lueders. "We are coming to grips with the handling of the 23 car," Sweedler said. "We have a pretty heavy push in the car and we are trying to dial that out. We are going to get the car race ready and push it to a good finish. In the race we will have to run consistently with no mistakes." "We are struggling a little with the handling of the car," Kapudija said. "We are getting some under steer. The track is really dirty, a lot of gravel and sand everywhere. We made some changes that helped the car, but still have some work to do. Most of the high speed corners are affected by our under steer, especially the downhill left hander, Turn Nine. We also have a major push in Turn 11. In the race it is survival. We need to stay out of the gravel and keep it on the track." "It is going alright so far," Lueders said. "I came here and had to learn the track as it is my first time racing at this circuit. The track is awesome it is a lot of fun. Turn Six and the Corkscrew are great corners. The car has a little turn in under steer that I am fighting. It is predictable and it doesn't surprise you. We need to find some more speed in the car for the race." Battery Tender joined the list of official partners for the American Le Mans Series presented by Tequila Patron and sanctioning body International Motor Sports Association on Friday. A producer of a full line of battery chargers using the most advanced levels of technology, Battery Tender increased its participation in IMSA and the Series, one of IMSA's five sanctioned road-racing championships. Ricardo Gonzalez will go away from the grid in his No. 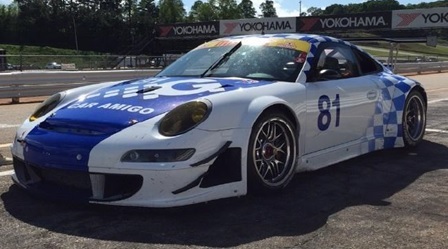 80 Car Amigo/Alex Job Racing/Porsche 911 GT3 Cup car from the fifth row based upon his qualifying time of 1:29.547. Ricardo Gonzales is teamed with Luis Diaz and Rudolfo (Rudy) Junco for the race that will take the green flag at 2:30 p.m. PT and finish in the dark at 8:30 p.m.
"Well we are definitely not where we wanted to be," Ricardo Gonzalez said. "We've made small improvements throughout the weekend but we still have to be a lot faster to keep up with the guys up front in outright speed. I think that for the race we will have a pretty good package as all three of us are very consistent and we are all very close on times. If we can keep clean and with a good rhythm we can definitely be somewhere near the top after six-hours." "I didn't get a lot of running today," Diaz said. "Tomorrow I´ll have a chance to try out some of the changes that we´ve been talking about. We still have to find a lot of speed out there not only by improving the car but also in our driving. It´s going to be a long race so luckily qualifying doesn't really matter too much here. A lot of people will make mistakes tomorrow and it is very important to stay out of trouble and be focused. This track has been very good to me in the past and despite a rough start to the weekend I'm still confident that we can climb to the front like we did at Long Beach." "We have a good car for the race, it's comfortable to drive and all three of us have confidence in it so that will be a big plus," Junco said. "It will help us find a consistent and mistake free rhythm. It has been a steep learning curve for me since I had never driven this car before. The Porsche has certain characteristics that are very peculiar and it's just a matter of time and turning laps before I figure out what it needs to go fast." Team owner Alex Job will have his three car armada poised for the six-hour run. "We were really up and down in practice and qualifying," Job said. "Butch was able to cool his tires and get a clean lap at the end to put us on the front row, a tribute to his skill and veteran approach. He and Juan will run their typical consistent race and be in the thick of it at the end. The guys in the 23 car need to come together on their set-up. We have some work to do with them during the warm-up tomorrow morning. This track can be tricky with the elevation and the sand, but I know that they will be ready for the race. Ricardo, Luis and Rudy are getting on well. Rudy has shown he has no real rust on him speed wise and is a great addition to the 80 team. We will be ready for six-hours and whatever will come with that tomorrow." Round three of the American Le Mans Series presented by Tequila Patron will be run at Mazda Raceway Laguna Seca on May 22. The race will be televised, tape delayed, on May 29 at 1:30 p.m. ET on CBS. The full race will be streamed live online at www.americanlemans.com starting at 5:30 p.m. ET in partnership with TodoCast.tv. Alex Job Racing is one of the most successful teams in ALMS history with 39 wins. This record is supported by 46 pole positions and 80 podium finishes. The team has won three championships (GT in 2002, 2003 and 2004) complimented by their two GT class wins at Le Mans. The team also boasts seven Sebring 12 hour wins. In 1999, Deltran introduced the Battery Tender Plus into the marketplace. The main reason was that many more AGM style lead acid batteries were being used in a variety of power sports engine start applications. Each and every Deltran Battery Tender Battery Charger® regardless of its size is programmed with a microprocessor that will correctly charge a battery then automatically switch to a maintenance/float mode. Refer to www.batterytender.com for more information. Simply Perfect in every way, Patrón tequila is an ultra-premium luxury white spirit that's delicious on the rocks, and mixes flawlessly into most any cocktail. From the highest-quality Weber Blue agave plants grown in the highlands of Jalisco, Mexico, to the centuries-old distillation process, to the signed, handcrafted glass bottles, Patrón is produced with unparalleled attention to detail. Imported and marketed by The Patrón Spirits Company, brands in the portfolio consist of Gran Patrón Burdeos, Gran Patrón Platinum, Patrón Silver, Patrón Reposado, Patrón Añejo, Patrón XO Cafe (tequila and coffee liqueur), and Patrón Citrónge (extra-fine orange liqueur), as well as Pyrat Caribbean rums, and Ultimat ultra-premium vodka. For more information, please visit www.patronspirits.com. Car Amigo is a motorsport restoration and preparation business specializing in restoring racing, muscle and historic cars. This Dallas, Texas based company offers complete rebuilds and custom fabrication as well as consignment and sales of history's finest automobiles, www.caramigo.com. IDN Business Consulting was born with the mission of designing and implementing fiscal strategies that allow companies a better development and resource management. IDN is made up of a professional, highly capable crew, where innovation, pro-activity and service quality is the base of our competitive ideology. At IDN Business Consulting the legal, fiscal safety and tranquility of our clients is guaranteed. This is based upon the objective of searching the development of innovative solutions that bring measurable and real business results. This has made IDN a market leader in Mexico. IDN has an extensive portfolio of solutions that bring solid savings and benefits to your company. IDN is the only fiscal law firm in Mexico that brings to you, wherever you are, whatever you do, these exclusive benefits. Cooper Gay is one of the world's largest privately owned Insurance and Reinsurance Broking Groups, headquartered in the City of London. Cooper Gay operates for clients in four broad segments: corporate organizations, retail brokers, professional reinsurance buyers and captive insurance companies. The Cooper Gay network extends from the Americas to Asia, Europe and Australasia. Offering a wealth of broking talent and customer support in our chosen business sectors, this translates into specialist insurance and reinsurance solutions in every risk area. The Rainmaker Group of independent companies has an international reach focused on providing integral measurement, preventive, and risk management solutions. "Integrity is Power". Through this philosophy we lead our clients in the understanding and management of their risk needs. Areas of expertise include - risk transfer mechanisms, actuary analysis, design of prevention plans, and management of international risk transfer programs. Tavares, Florida, Alex Job Racing (AJR) will be looking for their third win in as many races in the GTC class with this weekend's running of the American Le Mans Series (ALMS) Monterey presented by Tequila Patron to be run at Mazda Raceway Laguna Seca on Saturday, May 22. 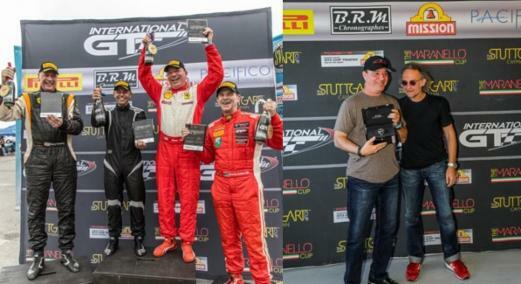 AJR's Juan Gonzalez and Butch Leitzinger are leading the GTC points by way of two consecutive wins at Sebring and Long Beach. The series will run a six-hour event at Laguna Seca. The 2.2-mile, 11-turn circuit known for its famous Corkscrew Turn will see the field start the race at 2:30 p.m. in the afternoon and finish in the dark at 8:30 p.m. PT. Gonzalez and Leitzinger, in their No. 81 Mission Foods/Alex Job Racing/Porsche GT3 911 Cup car have proven their speed and consistency in both endurance and sprint race formats. A commanding win at the season-opening Sebring 12-hour race was followed by a sprint win at Long Beach in the shortest race of the season at just 100-minutes. "Laguna Seca is a difficult track because of the sand and the gravel," Juan Gonzalez said. "In a long race like this you can't afford to go off of the track because you will most likely lose valuable time. A lot of the cars will run over the apex and throw sand onto the corners making it very slippery. I raced Laguna before in the 90s in the Monterrey Historics in several different cars like the Javelin Trans-Am (Penske No. 6), Can-Am Shadow (George Follmer), F1 Shadow (George Follmer), and an 962 Porsche ex Dyson (James Weaver/ Butch Leitzinger). We have a plan to do double stints and hope for the race to bring us good luck. You have to set up Turn 11 in a perfect way in order to carry a good line and good speed down the straight-away. The other critical part of the circuit is the breaking before the Corkscrew, you don't want to overcook the entrance, otherwise you will end up in trouble." "Laguna is particularly challenging due to the circuit's lack of mechanical grip, and the low temperatures that we sometimes get there," Leitzinger said. "It can be very hard to get tire temperatures up on the pace lap, which can make the first few laps of green flag racing very exciting. On top of that, the circuit is surrounded by sand, and anytime that someone drops a wheel off they bring that back onto the track, so you really never know what to expect at the next corner. My first race at Laguna Seca was when I was about 12 years old. There was a BMX track on the hill, so my brother and I threw our bikes in my Dad's trailer, and when he was racing on the proper circuit, we were pedaling furiously. I think that I won that race, but my memory could be wrong. Laguna is also on my favorites list because I won my two World Sports Car titles at Laguna, in 1997 and 1998. In an endurance race, you always have to keep the long goal in mind. It is always tempting to go for a gap that you are 70% sure will still be there when you get there, but over six hours, the 30% catches up to you. The Corkscrew gets all of the attention, but because everyone has to come to a virtual stop to go through it, it is very hard to gain a big advantage there. The most important turn is probably the turn leading onto the Bobby Rahal straight. It is pretty high speed, very challenging, and leads into a long, uphill straight, so any gains that you make in the turn are multiplied." Bill Sweedler and Romeo Kapudija will be looking for their first win in the No. 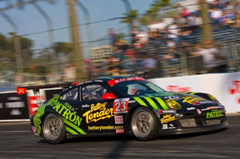 23 Battery Tender/Tequila Patron/Alex Job Racing/Porsche 911 GT3 Cup entry. The duo was one lap short of standing on the top step of the podium at Long Beach. They are second in the GTC standings and will welcome back Jan-Dirk Lueders for the six-hour run at Laguna Seca. "We will approach Laguna differently from Long Beach because the race is six-hours long and not 100 minutes," Kapudija said. "We will be less aggressive, but will keep a fast pace and will look to survive the first five-hours of the race. A race this long at Laguna will definitely create a lot of debris on the track and I am sure there will be lots of sand off line. The transition from sunlight to total darkness will also play a major factor and we will have to adapt to the changing conditions throughout the race. I have raced at Laguna for many years and love the track. For car set-up we will have to focus on turns Four, Five and Six as it will be crucial to carry as much speed going uphill as possible. These corners are also somewhat high speed and we will have to focus on exit speed. Also conditions will change as the temperature of the track drops at night and the handling of the car will be affected. Bill, Jan and myself will have to keep a quick pace throughout the race and we cannot afford any mistakes. We will have to be mentally and physically prepared for this race and will treat it as a 12-hour keeping a fast, but cautious pace throughout the race. The AJR crew guys have performed flawlessly and have given us a great car in the last two races. I am confident we will do well." "Laguna Seca is one of the finest facilities in the U.S.," Sweedler said. "I have raced there on several occasions and absolutely love the Corkscrew! We will be able to use every inch of the track - and then some - before you get to the kitty litter. To get to the winners circle we must be consistent. No mistakes and great pit stops. The Turn Two, Three and Four exchange is very important for set-up to maximize speed. In addition the exit of the Corkscrew and following Turn 11 need to be close to flat - so set up is critical." "Laguna Seca is not unlike other tracks in the U.S. as there is not much room for error," Lueders said. "The lack of run-off areas is great for the fans (they can get closer to the track), but that makes it even riskier for the driver to try and drive the car at the limit. I have never raced at Laguna Seca. It is going to be great! Consistency and no mistakes is what our goal will be. I think as a driver line-up we will probably have enough speed. We just cannot afford any mistakes. Turns Six and Nine are key to set-up on the Porsche. Not the most exciting corners of the track, but definitely the ones where you can gain or lose the most time." Luis Diaz and Ricardo Gonzalez will be looking to bounce back from a tough weekend at Long Beach in their No. 80 Car Amigo/Alex Job Racing/Porsche 911 GT3 Cup car. Diaz knows his way around Laguna Seca having won the P2 class last year. 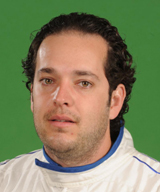 The 80 guys will be joined by fellow Mexican Rudy Junco who will be making his first ALMS start. "I'm really looking forward to this weekend, it's been almost a month since we last drove the car and I just can't wait to get behind the wheel again," Diaz said. This has been a very different season for me with the GTC cars but we are all very confident that at Laguna we'll be able to really show what we can do. Both Ricardo and I have gotten much more comfortable with the Porsche, Rudy has a lot of experience at Laguna and the AJR-Car Amigo team has a great car for us so we should easily be able to be fighting for the win this weekend. " "Even though we had a rough weekend at Long Beach last month it really gave us the confidence that we needed because we proved that despite all the problems we still have the pace to win races," Ricardo Gonzalez said. "I've never driven at Laguna Seca so once again it will be a learning weekend, but Luis and Rudy have a lot of experience at this track, not to mention the AJR-Car Amigo team. So we are actually very optimistic that this could be our breakthrough weekend where we get our first win. Overall I'm very excited, Laguna Seca is a classic track and I can't wait to get out there and see what it's like to drive around it at speed." 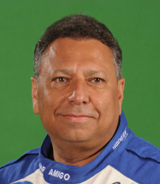 Junco last competed in a professional series in 2001, when he competed in the Dayton Indy Lights Series. Since then he has been busy earning his MBA from Stanford. "I'm very happy to have the opportunity to race alongside such experienced drivers as Luis and Ricardo," Junco said. "Both of them have done a great job so far this season and I hope that I can be a good addition to the team as we fight for the victory this weekend. The most important thing for me will be to quickly get up to speed and learn the car, I´ve been around this track many times so I just need to adjust to it with the Porsche. During the race I'm just going to make sure I can keep a good pace and have a mistake-free run. I think if we can all just keep this up we can finish at the front." Alex Job, team owner, has his team on a roll early in the season and is looking to keep the consistency going. The team has a strong history at the track, located just south of Monterey, with four wins. "We are having a great start to the season - so far," Job said. "At any time we've had our cars at the top of the time sheets in practice. Juan and Butch have shown great consistency and have proven to be a formidable team. Romeo and Bill have the speed, we just need to help them to put it all together for that first win. Luis and Ricardo are getting acclimated to the car and we are working hard to get them to the front. I think we will see a break-through event from them soon. We welcome back Jan-Dirk to the No. 23 and will have new comer Rudy Junco in the 80. Laguna Seca is a tough track. With the sand right off of the line, it is almost like running a street course. No room for error." 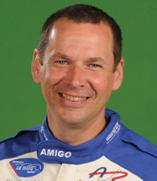 Alex Job Racing is one of the most successful teams in ALMS history with 37 wins. This record is supported by 45 pole positions and 75 podium finishes. The team has won three championships (GT in 2002, 2003 and 2004) complimented by their two GT class wins at Le Mans. The team also boasts seven Sebring 12 hour wins. Long Beach, Calif., Alex Job Racing's (AJR) Juan Gonzalez and Butch Leitzinger won the American Le Mans Series (ALMS) presented by Tequila Patron Long Beach Grand Prix. 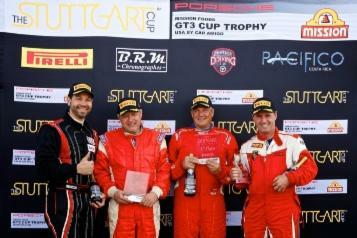 The duo posted their second win in as many races in the GTC class. Teammates Romeo Kapudija and Bill Sweedler came home third. Whether running for 12-hours at Sebring or 100-minutes at Long Beach Juan Gonzalez and Butch Leitzinger were able to back-up their Florida win with one in California. The winning moment of the race, unfortunately, was the losing moment for their teammates Kapudija and Sweedler. Sweedler put the No. 23 Battery Tender/Tequila Patron/Alex Job Racing/Porsche 911 GT3 Cup in the lead in GTC on lap 21. He then proceeded to lead the GTC race right up to pit stops on lap 37. The AJR crew was able to get Kapudija out still with the lead, which he held up until four-minutes to go in the race. The Chicago resident got into some debris on the track into Turn Five and spun. This allowed Leitzinger to pass for the lead and the win. AJR LB Podium 2 For Leitzinger and Juan Gonzalez it is there second win in the No. 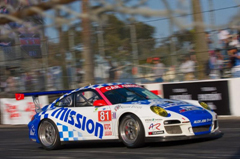 81 Mission Foods/Alex Job Racing/Porsche GT3 911 Cup car, making the season, so far perfect. "The Alex Job team really prepares a great car," Juan Gonzalez said. "The start of the race was a real challenge. There were yellow flags and everyone was taking chances. There was also water on the track from a competitor's radiator. I was able to keep a steady pace and was in touch with the leaders - Butch was able to do the rest. It was another great team win for the 81 Mission Foods guys." 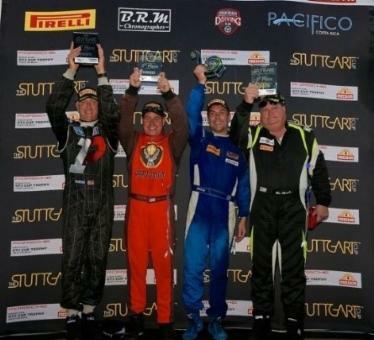 "We had a great race going with four cars at the front of the GTC field," Leitzinger said. "Romeo was leading in the 23 car and he got caught out in the marbles in Turn Five, which is easy to do. He had a spin and I was able to drive by. I feel for him, those guys ran a great race. It was one of those times when I thought to myself, this is really awesome. I was in the middle of a great four car race, with the faster class cars passing us, we were all trying to take advantage of how we could use the faster cars to get around the next guy. The race was a blast. I had a great time!" 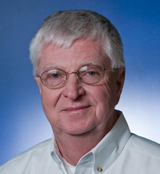 Bill Sweedler started the No. 23 Battery Tender/Tequila Patron/Alex Job Racing/Porsche 911 GT3 Cup entry. He was able to improve on the team's fourth place qualifying effort to lead race by lap 21. Teammate Kapudija then led, spinning with just a handful of laps remaining, settling for third. "I was pushing really hard to keep the lead," Kapudija said. "The team put together a phenomenal car. Unfortunately I got into the marbles and looped it around. I was able to keep it off the wall, recover and finish in third. Bill had a great start and motored up into the lead. 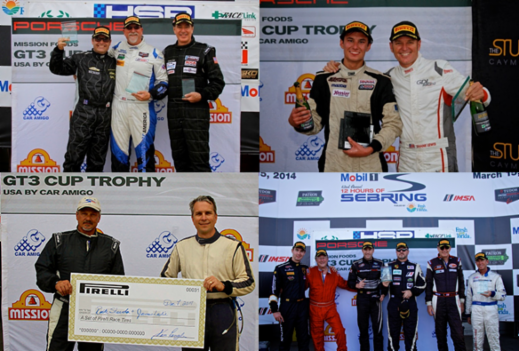 We have had two strong podium finishes in two races. The Battery Tender/Tequila Patron team is for real!" "We had a great race for an hour-thirty-six-and-a-half minutes," Sweedler said. "The start was crazy. One of the cars in front of us dropped back and that cost me some time. It took longer than I had hoped to get to the front. Romeo did a great job holding off Butch. Butch is a seasoned sportscar veteran with a lot of miles at this track. My hat is off to the Mission Foods team. The Tequila Patron/Battery Tender car was hooked-up. The track was slick with a lot of debris, but we had a good car. It would have been nice to be first and on top of the podium, but it wasn't meant to be here." A tough start to the weekend for Luis Diaz and Ricardo Gonzalez in the No. 80 Car Amigo/Alex Job Racing/Porsche 911 GT3 Cup continued into the race. The first practice of the weekend on Friday had the car in the wall. With only a handful of laps, Diaz qualified ninth. At the start of the race Diaz was able to drive through the field to run as high as third. During the pit stop, Ricardo Gonzales took over and upon his return to the track he felt a vibration necessitating another trip down pit road. As he rejoined he had to come back in a third time, under green, to serve a pit exit violation penalty which relegated the team to a seventh place finish. "From the first lap I could feel that there was something strange with the car but I just kept going and with some luck and a few passes we managed to climb all the way up to third," Diaz said. "We had very limited practice time so we weren't sure what to expect but we obviously proved that no matter what we can be up there fighting. Unfortunately when Ricardo got in the car the problem kept getting worse to the point that he thought there was a tire coming loose so he came in to have it checked and that cost us valuable time, then to make things worse we got a stop and go penalty plus 60-seconds. But overall we are pretty happy because these were probably the worst conditions you could have in a race weekend, no practice time and a damaged car in the race and still we were able to run at the front and its only a matter of time until we win." "Luis did a great job climbing through the field, as soon as I got in the car I felt a very heavy vibration and the steering wheel was askew," Ricardo Gonzalez said. "It felt very serious so I radioed that I was coming in the pits to have it checked. It turned out that we had a bad shock and I just had to deal with it for the rest of the race, it was uncomfortable to drive but I am very happy with my speed and my consistency. Even with all the problems and with the lack of practice we were right on pace with the leaders and I felt very comfortable. We need to work on a few things but I believe we have a very strong package between Luis and me and the Alex Job Racing/Car Amigo/IDN Porsche and we'll go to Laguna with only one goal which is to win." Team owner Alex Job celebrated another great finish with a win and a third. "What a day," Job said. "Juan and Butch are proving to be a very mature and consistent duo that make winning look a little easy. Bill and Romeo did a great job. They were fast all weekend and were in a great position to win, but came up four-minutes short. Luis and Ricardo had a tough weekend. Limited track time and the shock issue really hurt their chances. 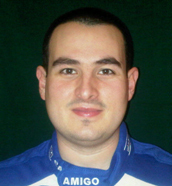 Luis showed great speed to get the car up to third, so the potential is there as well." Round three of the American Le Mans Series (ALMS) presented by Tequila Patron will be run at Mazda Raceway Laguna Seca on May 22. 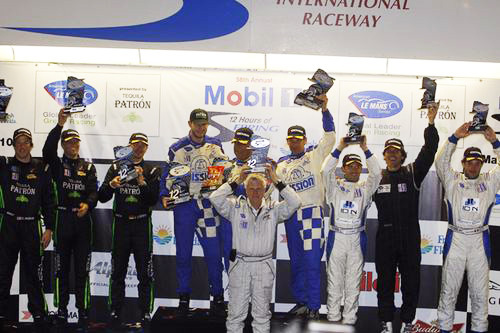 Sebring, Fla., Alex Job Racing (AJR) swept the GTC podium tonight in the 58th running of American Le Mans Series (ALMS) Presented by Tequila Patron Mobil 1 Twelve Hours of Sebring race. The AJR entered No. 81 Mission Foods Porsche took the win with the team car No. 23 Battery Tender/Tequila Patron coming second and the No. 80 Car Amigo 911 finishing third. Leh Keen shot off to an early lead behind the wheel of the No. 81 Mission Foods/Alex Job Racing/Porsche GT3 911 Cup. The new to ALMS competition driver set the pace for the field early on by running laps a second faster than the rest of the field. The speed and motivation carried over to teammates Juan Gonzalez and Butch Leitzinger. Aside from a stop-and-go-penalty for a pit stop violation, the team's time at the front was never lost. For Keen it is his first win at Sebring and in ALMS competition as well as having the honor of posting the fastest lap of the race in GTC. 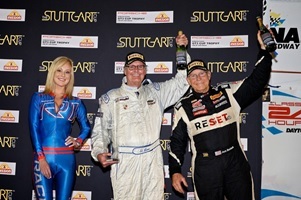 For Leitzinger it his second win, the first was 20 years ago. For Gonzalez it adds to his family's legacy at Sebring where his brother (Roberto) finished third in 1976. "It wasn't easy," Keen said. "The race was pretty intense. I have to give it to Alex - one-two-three on the podium is a great achievement as well as the same result from qualifying. His team puts together some great cars. We don't have a dent or a scratch on our car. We kept it clean. The only hiccup we had was the pit lane violation. We were able to finish with a couple of laps lead. 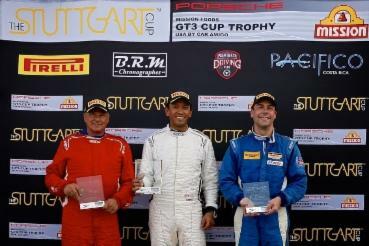 I am happy to be a part of the team and of course have the top step on the GTC podium." "This is a dream come true for me," Gonzalez said. "I have been racing at this track for 20 years in vintage. I always wanted to run the 12-hour race. In 1976 I was here when my brother finished third. This is an accomplishment for me and one of my dreams. Alex, Butch and Leh made the dream come true. I did my part behind the wheel being steady and staying out of trouble, a great day!" "Leh and Juan did a great job," Leitzinger said. "By the time I got in the car we had a great lead and that makes it easy. The car preparation was great, other teams were having problems. I just kind of pumped out laps. I hate to say it, but it was about as easy as a race at Sebring ever gets. Nothing was really asked of us. We didn't have to throw out huge laps to catch someone or make-up ground. Leh gave us a big advantage at the beginning and we never seeded it after that point." The No. 23 Battery Tender/Tequila Patron/Alex Job Racing/Porsche 911 GT3 Cup driven by Romeo Kapudija, Bill Sweedler and Jan-Dirk Lueders finished the day in second. The team had to battle back from some overzealous driving that resulted in a couple of spins on the track. "My last stint was the dusk run into the dark," Sweedler said. "The only issue we had was that we couldn't use the brights with the lights. We were able to bring it home in second. Alex and the team did a great job all week. We had a mishap on the track on Wednesday and the guys had do some body repair, but they got us back out on Thursday as good if not better than it was on Wednesday. Romeo and Jan-Dirk were very solid behind the wheel all day." 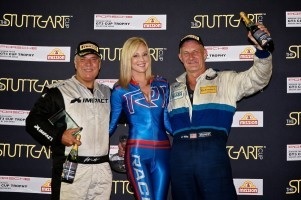 "It was a great day for Alex Job Racing, Battery Tender and Tequila Patron," Kapudija said. "The team worked really hard to get the car flawless for the race. My last stint I just drove it around like it was Sunday. I was a little nervous, I made sure that traffic wasn't an issue and we weren't in the way. I am happy for the second place finish. My teammates did a great job. Everyone came in fresh and my off season conditioning really paid-off." "It was awesome," Lueders said. "My last stint was in the dark. I like driving at night and in traffic. We had a little high-speed under-steer in the car, but other than that it was a lot of fun. The guys in the other classes were very fair and they were clean with their overtaking. The team supported us from A to Z. We had a few small mistakes, I had a drive-thru penalty because of a pit lane speed violation. In general it was a real smooth race for us. Thanks to the great preparation by the team we had a great day." Luis Diaz, Ricardo Gonzalez and Patrick Kelly finished third in their No. 80 IDN/Car Amigo/Porsche 911 GT3 Cup car. After starting in third position the trio ran into some early issues with flat spotted tires and a malfunction with the driver cool suit, causing them to pit out of sequence. Once they settled into a rhythm they were able to drive back through the field and take the third step on the podium completing the AJR sweep. "I am very happy, what a great way to start out the year," Diaz said. "At the beginning of the race we had a lot of issues and it really didn't look even possible to make it to the podium. But everybody in the team did a great job, the three of us managed to be very consistent and nobody put a wheel wrong. We just kept fighting and pushing and slowly we came back from last to third. We are very optimistic for the rest of the year. The Alex Job Racing/Car Amigo team started and finished 1-2-3 today which just shows the quality and potential of the team. I'm sure we'll be able to repeat many times this year. I am very proud to be able to represent IDN, Cooper Gay and Rainmaker Group and to have them with me on the podium." "What a great feeling," Gonzalez said. 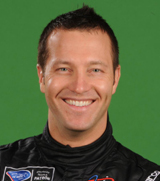 "I had always dreamed of competing in ALMS and to be on the podium on my first start is amazing. We have been working on this project for a long time and now thanks to IDN, Cooper Gay and Rainmaker Group here we are in Sebring, third in class and with the best team in the paddock. I really enjoyed the race, it was tough at first but during my second stint I managed to pick up a couple of positions and just got into a rhythm and kept closing the gap to our teammates in front. The team gave us a great car, even though Luis and I had very limited experience in our Porsche 911 GT3 the whole crew made it really easy for us. I am very excited for the rest of the season, I have no doubt we'll be able to win races this year." "The car ran great," Kelly said. "We were able to double stint our tires. I made a slight error, I let go of the pit lane speed limiter too early. I had a couple of bobbles, but I think my pace was really good. There was fits and spurts in traffic, I would have five laps of traffic and then five clear. In my first stint the cool suit wasn't working. I had water in the coils, but it just heated up and it just baked me. I was able to recover and get back in the car." Alex Job celebrated his seventh Sebring win. 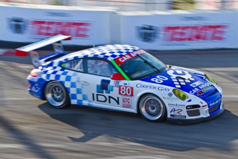 The team received their three Porsche 911 GT3 Cup cars just four weeks ago and the No. 80 car was just finalized 10-days ago. The crew did heavy labor preparing the cars for the 12-hours which paid off with the one-two-three finish. "The entire crew put in a lot of work the past couple of weeks," Job said. "This is a grueling race, but the driver line-up we have almost made it look easy. We had a few spins and a couple of penalties, but no one got rattled and everyone did their job. Juan, Leh and Butch ran a flawless race, not so much as a wheel wrong all day. We had a slight bobble in the pits that cost a one minute penalty, but the guys were able to maintain their lead. Romeo, Bill and Jan-Dirk had some early jitters, this being their first 12-hour, but they soon settled down and drove it up to second place. Luis, Ricardo and Patrick also had a few small issues and were able to overcome them and complete our Sebring sweep of the podium. It is very rewarding to come down here with nine drivers, over 30 crew members and have everything go your way." The series will travel to the streets of Long Beach, California for the Long Beach Grand Prix to be run on April 17. Alex Job Racing is one of the most successful teams in ALMS history with 37 wins. This record is supported by 45 pole positions and 75 podium finishes. The team has won three championships (GT in 2002, 2003 and 2004) complimented by their two GT class wins at Le Mans. The team also boasts six Sebring 12 hour wins. Photo caption from left to right: Bill Sweedler, Romeo Kapudija, Jan-DIrk Lueders, Leh Keen, Juan Gonzalez, Butch Leitzinger, Luis Diaz, Patrick Kelly, Ricardo Gonzalez, center in white Alex Job. Based in Irving, Texas, Mission Foods was established in 1949. 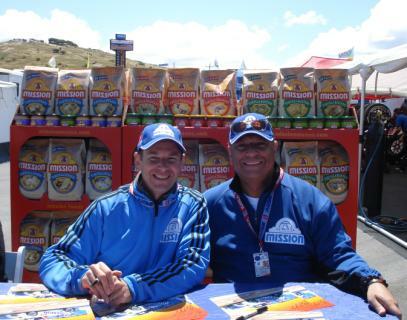 Mission Foods is one of the world's largest tortilla, flatbread and corn flour producers and is engaged primarily in the production, marketing, distribution and sale of tortillas, chips, wraps, flat breads corn and wheat flour. For more information reference www.missionfoods.com.